(39) Mens Vintage 70s Blazer! Sage, Black & Brown Houndstooth Plaid! 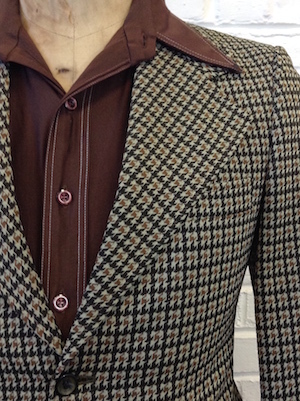 Home > Men's Vintage Shirts > Men's Vintage Shirts: 1970s > (39) Mens Vintage 70s Blazer! Sage, Black & Brown Houndstooth Plaid! 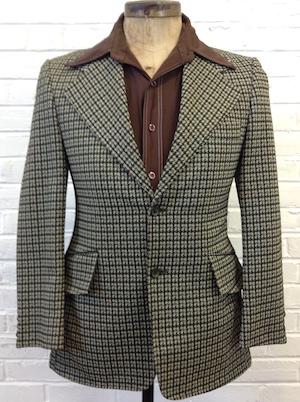 Mens vintage 1970s disco sport jacket! Funky fresh sage, black and brown and houndstooth plaid! 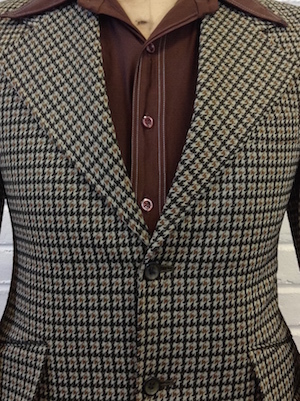 Super wide 70s split lapels, two marbled olive colored buttons in the front and three matching buttons on each sleeve. Three front pockets and a dual back vent. 3/4 lined in a sage acetate. Tagged by Smiths. No material tag but feels like 100% polyester.